cPanel is one of the available control panels you can select for your DV Server. When you newly provision or revert your DV to default, you will need to set the cPanel password before you can begin using the interface. Watch this video to learn how to set or reset your cPanel password. 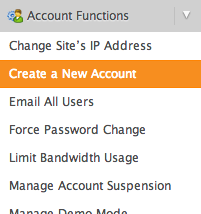 You can access cPanel from your AccountCenter. Sign in to the AccountCenter and click on cPanel next to your primary domain. Make note of your WHM URL. This is how you will access WHM after you update your password. Click on , located to the right of your current cPanel password. This will link you to the Root Access & Developer Tools page. Click on Enable Root Access. You will then be asked why you are changing the root password. Please note that any answer in this block is acceptable. After this, you will be prompted to create a new strong password. IMPORTANT: This will set the root password for your server. It is highly recommended that you not use a password that is currently used elsewhere. Enter your new password twice. 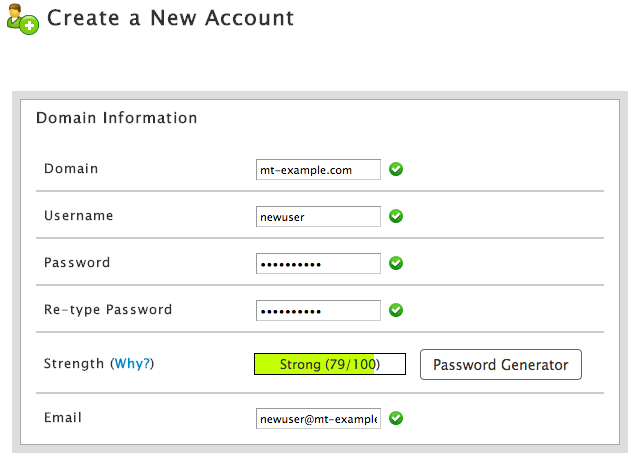 Make sure that there are green checks next to each of the strong password requirements to the right. Click on the WHM URL that we made note of earlier. This is your access domain. A new tab or window will open. If this is your first time visiting the control panel from this browser, you will see a certificate warning. This is normal. 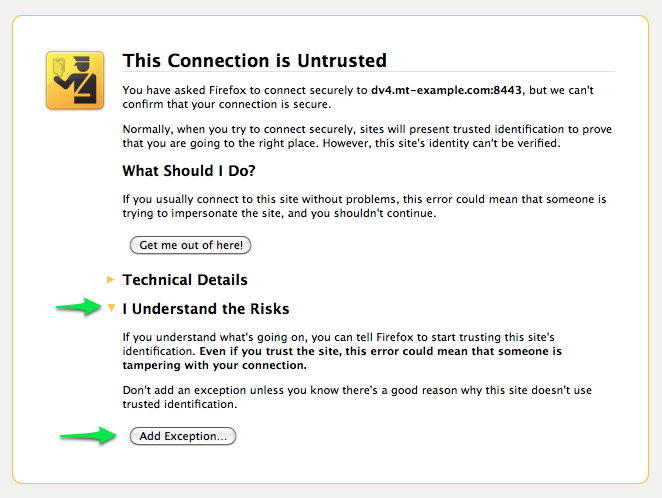 Your server comes with its own certificate, rather than a purchased certificate, so the connection is secure but you will still see the browser warning. You should continue to the site. Click Add Security Exception to proceed. In Chrome, you can click Proceed anyway to continue. In Internet Explorer, you can click Continue to this website to proceed. You will now see the WHM login screen. Fill in your username root and the password that you set up in the AccountCenter. First, you need to accept the license agreement. Next, you will need to add required network information. You may also opt to add additional contact information if you like in this section. Add an email address you may be contacted at. Make sure that your Server's Hostname is your access domain. 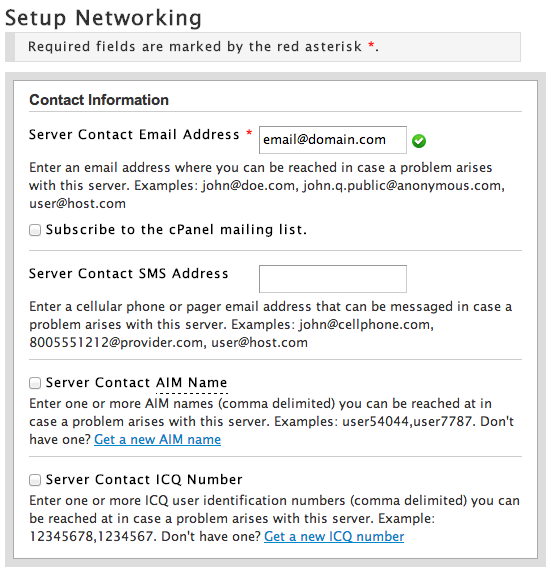 Add the IPs for your nameservers. 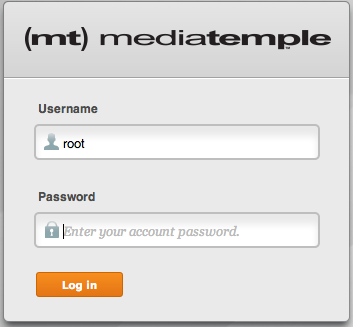 If you are using (mt) Media Temple nameservers, these will pre-populate automatically on your server. You can also find this information in your Server Guide. At this point, WHM will automatically verify what IPs are assigned to your server. You can continue by clicking Go to Step 4. The setup will then ask whether or not you want to use private nameservers and allow you to configure them here if you choose to. If you have registered your domain with (mt) Media Temple or elsewhere, you should be able to use their nameservers and this is not necessary. Unless you have a special need to host your own nameservers, we recommend you do not enable this additional service on your server to avoid unneeded cpu and memory utilization. You may always enable this service inside WHM at a later time. 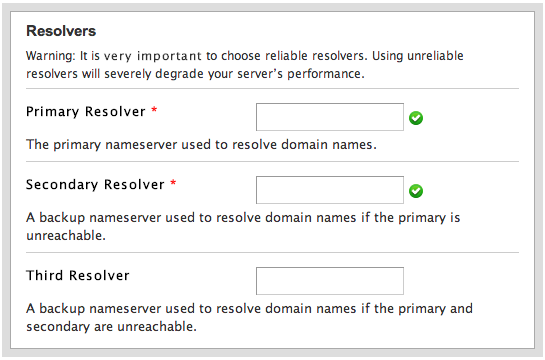 Choose to enable private nameservers, or leave this service disabled (recommended). Enter the nameservers this server will use for DNS. If you have left private nameservers disabled, you may use ns1.mediatemple.net and ns2.mediatemple.net. (Optional) If you have enabled private nameservers, you may need to update this information and add A record entries. Otherwise, this may be left as is and you can continue to step 5. This section allows you to configure your services like FTP and mail. 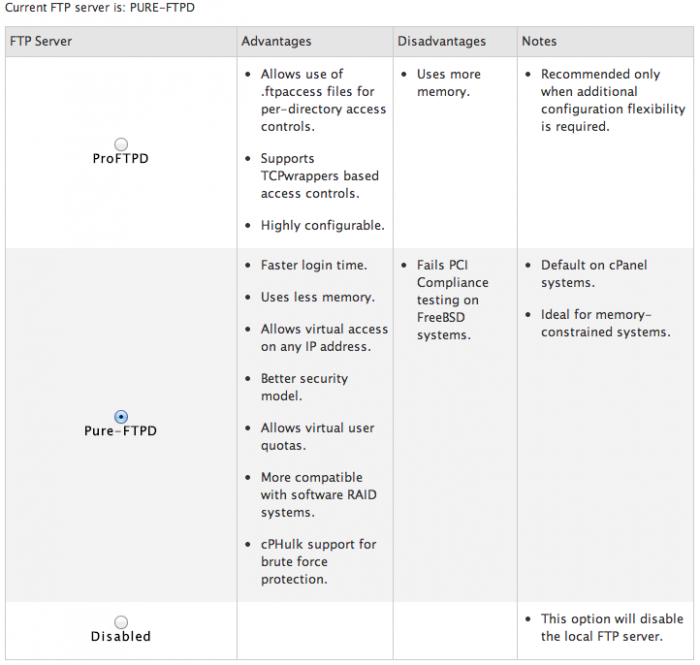 You have a couple choices when deciding what FTP service to use. Both have advantages and disadvantages. We recommend that you read more about the two services if you will have specific needs. Pure-FTPD is selected by default. For mail, you have two options as well. You may choose Courier or Dovecot. 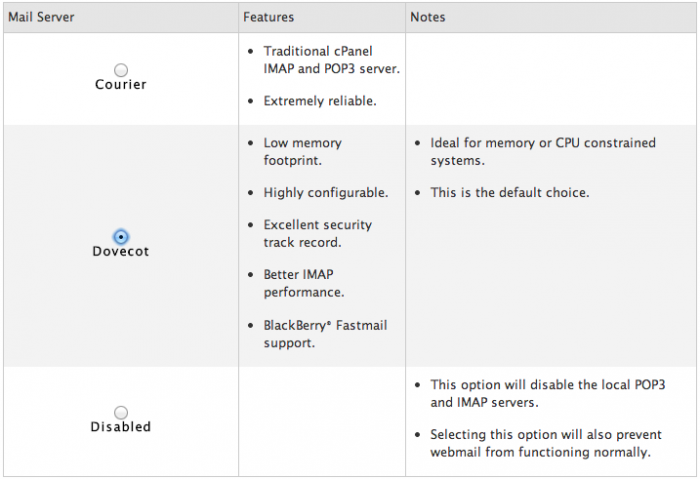 Dovecot is a newer mail service and is recommended for IMAP. Dovecot is selected by default. Next, you can opt to enable cPHulk. This is a brute force prevention service that can help lock out anyone who uses multiple inaccurate password attempts. This service can also ban IPs that these attempts are coming from. This can be helpful in preventing a brute force attack on your server. However, this can also cause users who forget their password to access the server to get locked out temporarily or have their IP banned. We recommend looking into the advanced settings and configuring this further if you intend to use cPHulk. You may also choose to not enable cPHulk at this time or enable it at a later date. Lastly, you can add a common set of perl modules to /user/bin/perl on your server. These are not installed by default. Many CGI applications require these modules to function correctly. To add these perl modules, make sure this box is checked before proceeding to the next step. The last step will allow you to enable filesystem quotas. If you will be acting as a reseller or hosting sites for others and wish to set quotas for usage, you will want to enable this. The option to enable quotas is selected by default. After choosing, you can click Finish Setup Wizard to finish this first time setup and enter WHM. You have now completed the basic setup of your server! Once you're finished with the Setup Wizard, you will have the ability to enable some additional features. These features are all optional you can opt to enable any of these now or at a later time. The next step will be adding a an account for cPanel. This will allow you to access the cPanel console for website management. To manage your domains you will want to create a new account for cPanel access. This also will add a domain in cPanel and create a user that will have FTP and email access. During this time you will also be able to designate the new account as a reseller account if you like. Find and click on Create a New Account from the menu on the left. This will take you to the panel to create a new account. Input the domain, username, password, and email in the Domain Information box. In the Package section, you can check the box for Select Options Manually. This will allow you to define limits for this new user. You may also save these settings as a package for future use. In the example below, a template with these settings will be saved as a package named "avguser" that can then be applied to any additional accounts that are created in the future. You may also choose to make this new account a reseller, or allow the account to own itself. Lastly, you can define if the email for this domain will have local mail. If mail is going to be hosted somewhere else other than this server, be sure to select Remote Mail Exchanger to prevent any mail conflicts. That's it! Once this is complete, you will be able to log into cPanel with this new account user and manage content for this domain.